S. No. 1— Item no. 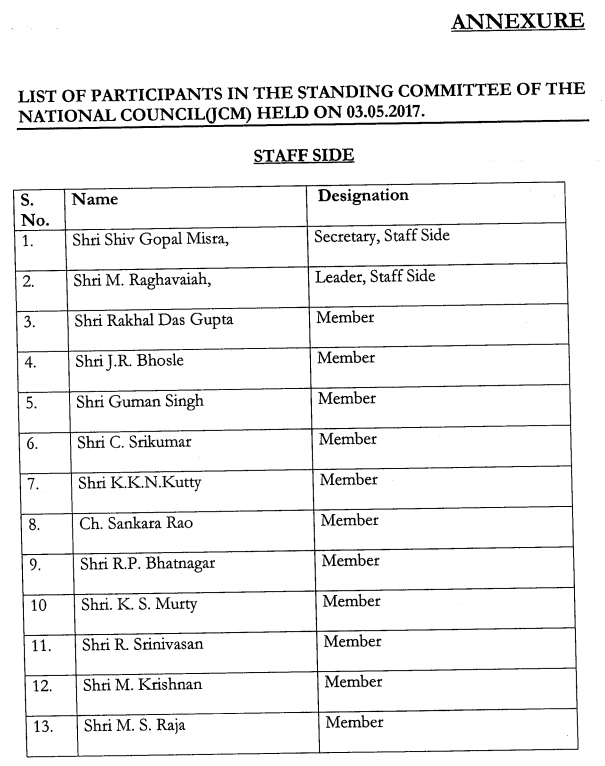 5(i) of the Standing Committee meeting of 25.10.2016. JS(Admn and JCA) mentioned that as desired by the Staff Side, the minutes of the earlier meetings held on 07.05.2014, 25.02.2015 and 09.10.2015 had been circulated to the Secretary and members of the Staff-Side. It was decided that the item may be closed. S. No. 2 – Include Grameen Dak Sewaks within the ambit of 7th CPC. Department of Posts had informed through their letter dated 07.02.2017 that a one-man Committee constituted to look into the service conditions, emoluments and other facilities of Gramin Dak Sevaks has submitted its report and the same has been hosted on the website of the Department of Posts. Further, due to the then prevailing Model Code of Conduct, no further action could be taken till it was lifted in March, 2017. The representative of the Department of Posts informed that the report had been examined and the financial implications were being worked out. The proposal will then be forwarded to Ministry of Finance before taking a final view. The Staff-Side expressed satisfaction on the development. It was decided that the item may be closed. S. No. 3 — Settle all anomalies of the Sixth Central Pay Commission. Additional Secretary, Department of Pensions & Pensioners’ Welfare informed that in respect of one of the pending items viz. anomaly related to modified parity in pension had been settled and orders had been issued to this effect. It was decided that the updated statement may be re-circulated to all and this item taken up in the next meeting. The Staff-Side pointed out that there had been several items in the Anomaly Committee. ATS has not been circulated. 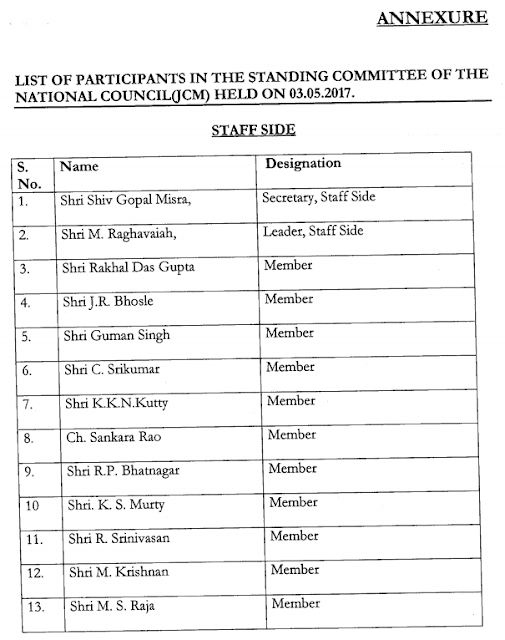 The Official side assured to circulate the ATS on all anomaly committee items. It was then decided that the Staff- Side will present its views after it is circulated. Members of Staff-Side rebutted that the reply of Ministry of Railways was not correct as the committee is not looking into the point raised in this agenda item. At this point, Chairman asked the representative of Ministry of Railways to share the terms of reference of the said Committee with the members of Staff Side. On the point related to Ministry of Defence (MoD), the representative of the Ministry shared a Note on the ‘Status of FDI in Defence Sector’. As per the Note, defence manufacturing sector was opened for the first time in 2001 for 100% private sector participation including FDI. In 2001, the FDI upto 26% was allowed under the Government route (FIPB approval). Since then, the policy has been revised several times. The FDI Policy for defence sector was last revised in June 2016. As per the revised policy, FDI upto 49% is allowed under automatic route and beyond 49%, under Government route, wherever it is likely to result in access to modern technology or for other reasons to be recorded. FDI policy for defence is applicable to defence industry subject to Industrial Licence under the Industries(Development & Regulation) Act, 1951. The Policy is also applicable for manufacturing of small arms and ammunition under the Arms Act, 1959. He clarified further that this sector badly needs capital investment and infusion of technology for which foreign investment can play a significant role. Investment promotion and technology transfer being of prime concern, Government believes that the amendments made in the policy could be the most trusted route to technology transfer which would help in increasing the defence production base and providing the much-needed impetus to self-reliance and indigenisation in defence sector. Members of the Staff-Side stated that the present Policy is likely to impact the existing Defence Establishments like DRDO and Ordnance Factories. The recent decision of DDP to outsource 143 products produced by ordnance factories would affect the existence of the organization and its employees. This is against the assurance given by the Ministry of Defence that the products already being produced by ordnance factories would not be outsourced and, for any new products, ordnance factories would be given first preference. However all these major policy decisions were taken without any discussion with the Staff Side and without hearing their view points. It was decided that the Ministry of Defence would be requested to hold discussion with the Staff side on the subject matter and accordingly the issue would be referred to Ministry of Defence. It was decided that the item may be treated as closed. Department of Posts has informed through their letter dated 07.02.2017 that there is no proposal of corporatization /privatization at this juncture. The said Department has further stated to be making efforts to give better and competitive services to the customers specifically in the areas of insurance, banking and parcels. The Staff-Side representative confirmed that D/o Posts has communicated to them that there is no proposal to corporatize the postal services at this juncture. It was decided that the item may be treated as closed. iii) For the purpose of final Cadre strength of the Railway Services, as was done in the last Cadre Review, 75% of the Work-charged’ posts may be added to arrive at the final strength. technology. On the concerns expressed by the Staff-Side on security related aspects, the representative of Ministry of Railways was asked to take note of them. It was also directed that the Ministry of Railways be informed of the new points raised by the Staff Side in this matter. made clear by the said Committee that they cannot commit on a minimum pension. It was stated that although the defined benefit pension scheme has been re-introduced in many places and the experience of those organisations should be taken into account, the fact remains that employees are not getting any benefit of the New Pension Scheme though they are the people who have put in their money. It was informed that these concerns were expressed before the said Committee but there has been no response. Even a minimum assured pension as provided in CCS(Pension) Rules-1972, Family Pension, Disability Pension are not guaranteed and there is no provision for GPF. Hearing the Staff-Side, Chairman remarked that the mandate of the Committee seems to be about the NPS and making it more effective. 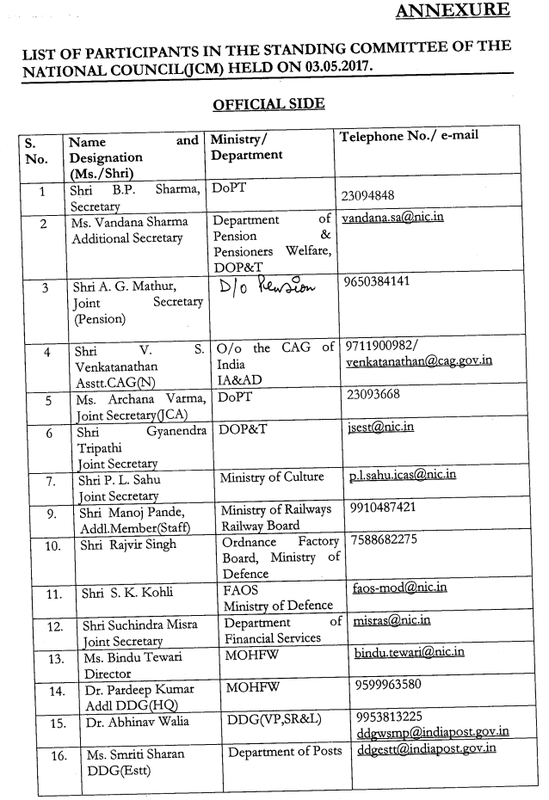 Noting that the Staff-Side are in favour of scrapping of the PFRDA Act and reverting to the old pension scheme, it was directed to the representatives of Department of Financial Services and Department of Pensions & Pensioners’ Welfare to bring the concerns expressed by the Staff-Side to the notice of the Committee set up to streamline the NPS. Ministry of Health & Family Welfare had vide O.M. No. B-12014/01 /2016- JCM dated 05.04.2017 informed that there was no proposal to close down the medical stores depots immediately. However, the house believes that MoHFW should hold discussion with the Staff-Side and recommends accordingly. About printing presses, the representative of Ministry of Urban Development informed that a proposal is afoot to rationalize the Government of India Presses and modernize them. It was stated that there would be no retrenchment of the existing employees of the Presses and there may be redeployment of some staff. Regarding publication and stationery department, no decision has been taken so far. On this the Staff Side desired that whenever a decision is taken to re-deploy the staff, the stakeholders should be consulted. It was decided that in view of the clarification provided by the Ministry of Urban Development that there would be no retrenchment, the part of the item concerning them may be closed. Further, Ministry of Urban Development may hold discussions with the Staff Side on deployment, as and when the stage comes. pension scheme in 2004 should be covered under the old pension scheme. DoPT, in its response to Ministry of Railways, had proposed for a methodology of screening. To an observation that DoPT is not giving replies, JS(E), informed that the instructions issued by DoPT on 26.02.2016 on contribution to GPF and Pension under the old pension scheme have already addressed this situation and such employees would be covered under that. Further discussion on this point followed later. S. No. 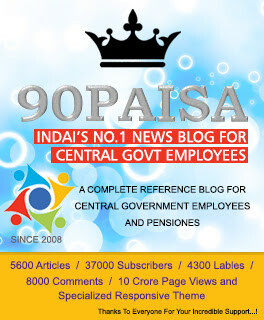 10 – Revive JCM functioning at all levels as an effective negotiating forum for settlement of demands of the central government employees. received so far. On the status of the Staff associations under DoPT, it was stated that the existing associations were being granted extension and have been requested a number of times to submit the present position on their representation. As none of the associations have fulfilled the mandatory requirement of 35% representation, fresh recognition cannot be granted. No proposal has been received. The Staff-Side explained that the grant of recognition to Service Associations is pending for years together in various other Departments, without even communicating reasons therefor. They wanted the DoPT to make inquiries into this matter and seek a report from all ministries as to the status of recognition to Service Associations. They suggested that DoPT conduct verification on their own on basis of the declaration filed by the applicant associations. Only in a situation where no association is able to comply with the 35% stipulation, no recognition should be granted. On this JS(Admn and JCA) assured to look into the matter. never said that this be limited to 5% but it is to be ensured that the compassionate appointment is not misused. The court ruling should not be used to deny compassionate appointment to the deserving candidates. Representatives of Ministry of Railways were requested to provide any data on the instances of giving compassionate appointment so that the issue could be further examined. It was also decided that the Ministry of Defence and DoPT would examine the issue in light of the points mentioned by the Staff Side. Establishment Division, DoPT, vide their letter dated 09.02.2017, had informed that action on this point was required to be taken by Cadre Review Division and a letter had been written to the concerned Joint Secretary. With regard to other demand i.e. grant of MACP in promotional hierarchy, they informed that if MACP was granted in the promotional hierarchy, it would give rise to uneven benefit to employees falling in the same pay scale since several organizations had adopted different hierarchical patterns. Consequently employees working in organizations having larger number of intermediate grades would suffer because financial upgradation under MACPS would place them in lower pay scale vis-a-vis similarly placed employees in another organization that had fewer intermediary grades. Further, 7th CPC has also recommended that MACP will continue to be administered in the hierarchy of levels in the Pay Matrix. Staff-Side opined that the previous ACP scheme was far better because it was in promotional hierarchy while MACP scheme provides upgradation in grade pay hierarchy. Staff-Side further stated that the two financial upgradations under the previous ACP scheme after 24 years were more beneficial than what an employee would get after three decades under the MACP Scheme. On this, the Chairman observed that the Standing Committee cannot look into issues which have been settled by the 7thCPC. It was informed that when this anomaly was earlier pointed out to the Joint Committee it was promised that this would be reconsidered and rectified. They suggested that if the MACP scheme was considered more beneficial, the employee should be given option to choose whether he wants ACP scheme or MACP scheme. The Chairman desired to know if there was any pay commission recommendation on this issue, on which he was informed that there was not. It was decided that the Establishment Division would examine the issue further. Ministry of Defence (MoD) vide their OM dated 28.04.2017 had informed that the issue regarding non-applicability of CCS (RSA) Rules, 1993 to the workers employed in Defence Establishments, was earlier discussed in the 46 thOrdinary Meeting of the National Council CM) held on 15.05.2010,and 91″ Depaitmental Council Meeting of Defence held on 18.11.2016. CDRA has stated that in a meeting held on 12.05.2003 in Ministry of Defence, it was observed that there had been two different recognition rules for Unions and Associations and it was unanimously accepted that the present system of membership of Workmen in the Associations as well as in the Unions should not be disturbed and the matter was treated as closed. So, he requested that this demand should not be accepted and the ‘status quo’ may be maintained in all the Defence Establishments for functioning of the Recognized Service Associations. Ministry of Defence further stated that it was important to note that recognized Federations of MoD kept silent from 2003 to 2009 and did not raise this issue in the light of the decision taken on 12/05/2003. It is perhaps due to the declining membership of Unions in the Defence Establishments that these unions desire to raise their membership at the cost of Associations where workmen are also their members. Moreover, it is a policy matter of MoD to allow workmen to. continue both as members of Associations as well as of Unions and the same was also unanimously approved by the then representatives of recognized Federations of MoD in the meeting held on 12/05/2003. In the light of the above facts, MoD has now sought to know the reasons from all the recognized Federations as to why the matter was again raised in the National JCM Council Meeting in 2010 while it was already unanimously resolved on 12/05/2003. After obtaining their views, the matter will be discussed to reach a conclusion. Responding to the statement made by, the Ministry of Defence, the Staff Side stated that the meeting held on 12/05/2003 with recognised Federations was nothing to do with the present issue. The discussion held on 12/05/2003 was with regard to Secret Ballot Verification of membership of the Federations and Associations to decide about the proportionate representation in the JCM Scheme. Since the MoD at that point of time was permitting workmen to be members of both Unions and Associations, it was decided that they should be allowed to participate in the Secret Ballot. The contention of the Staff-Side was that the MoD should follow the CCS(RSA) Rules, 1993 which prohibits worker to become members of the Associations and the recognition granted in violation of the rules to the associations of workers may be withdrawn, since the workers are governed under Trade Union Act, 1926 and Industrial Disputes Act,1947. It was decided that Secretary, Ministry of Defence would be requested for a meeting to discuss and settle the issue. Staff-Side stressed that the recognition has to be in accordance with the rules. It was decided that Secretary, Ministry of Defence would be requested for a meeting to discuss the issue. re-examine the issue and take an appropriate view in the matter. Establishment Division had through their letter dated 03.02.2017 informed that DoPT was in receipt of complaints regarding misuse/corruption in LTC especially in cases of LTC-availed travel to Jammu & Kashmir, North East regions and Andaman & Nicobar Islands. In the wake of reported scams, DoPT has been impressing upon the need for booking the LTC tickets from authorised agents and has been circulating such instructions amongst Ministries / Departments to create awareness amongst Government employees. Granting en-manse relaxations without proper examination of the LTC claims may not serve any public interest and in fact may encourage the unscrupulous persons. The Division is of the view that the Ministries/ Departments need to examine the cases on merit. Only exceptional cases where the Ministry/ Department is satisfied that undue hardship is being caused in any particular case, it may be referred to DoPT for consideration. In cases of any fraudulent claims/ attempts to inflate the claims, appropriate disciplinary action should be taken by the respective Department. Staff-Side stated that Group C and D employees were not aware of the rules. They were also not informed that they would have to procure tickets from the authorised agent or from the website of airlines. Later a clarification was issued that tickets were to be purchased from the authorised agents. At the same time, notices had also been issued that the amount would be recovered from salaries in case of non-compliance. They stated that if somebody had done wrong or had not travelled at all, then action may be taken. However, if the persons had submitted proper bills and boarding passes, they should not be subjected to recovery. Staff-Side stated that DoPT had advised that each case should be sent after examination on merit and had also sought details of number of cases. JS(E) stated that the total number of employees have not been ascertained and no definite answer on the number of employees who are affected by this has been given. On this, Chairman observed that giving an exact number may be difficult as it could be in thousands. Staff Side suggested that the concerned administration which gave the LTC advance may examine if the employee had actually travelled. If there is any difference in the fare charged by Air India on the day of travel, the excess amount may be recovered from the employee. It was stated that the employees are facing hardship as it was not initially specified to them that they should purchase ticket only from an authorised agent or from the website of the airlines. It was decided that Establishment Division of DoPT should relook into the issue in view of the difficulty faced by the employees. was decided that the item may be closed. Department of Expenditure had through their letter dated 24.01.2017 informed that the recommendation of the NAC for grant of entry pay to all the promotees under 6th CPC had been considered by that Department. However, it was not agreed to considering the fact that it was in modification of the recommendations of the 6th CPC. This decision was taken with approval of Finance Minister. 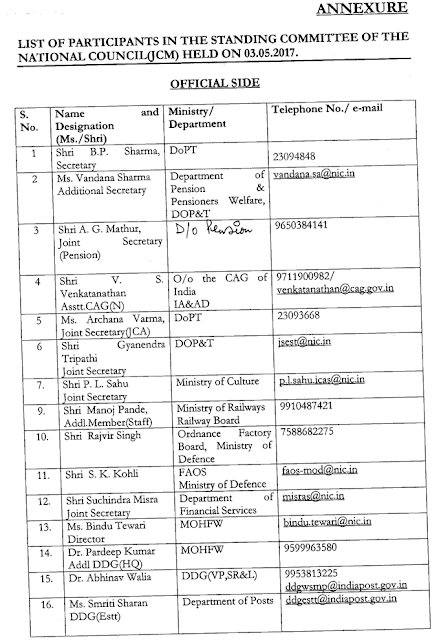 However, in the light of the order of the CAT, Principal Bench, Chennai, they have requested Ministry of Defence and Department of Revenue to intimate the action taken by them since the applicants of the OAs are working in those departments. A reply is yet to be received. Staff-Side stated that this problem is acute in organisations where there is no direct recruit or recruitment has not taken place for some time. As such there is no junior direct recruit employee. Considering the submission made by the Staff-Side that no person’s salary could be fixed at less than the minimum of the pay scale or pay band, as the case may be, the Official Side had agreed to raise the pay of promotee officials on par with directly recruited personnel, irrespective of the fact whether direct recruitment has really taken place or not. The said agreement ought to have been translated into order. It is not correct for the Finance Minister to dishonour the agreement and no tangible reason has also been advanced by the Official Side for such a decision. Noting this to be an anomalous situation which causes suffering to the employees, it was decided that the Department of Expenditure would re-examine. Establishment Division had through their letter dated 09.02.2017 informed that a formal proposal of M/0 Defence had been received. The matter was discussed with the representatives of M/o Defence twice i.e. on 19.01.2016, and 26.01.2016. The issue will be referred to D/o Expenditure for reconsideration of their earlier advice. The Staff-Side expressed satisfaction with the action taken. It was decided that the item may be closed. (i) D(Civ-II) – The proposal was examined in MoD and it was decided that the same cannot be recommended for making amendment in Rule 6 of the CCS (Leave) Rules, 1972 unless there is strong justification. The position was explained to AIDEF vide letter dated 08.04.2016. Recently, on 12.04.2017 MoD has sought comments from concerned Directorates/ Organisations/ Service Headquarters in this regard. 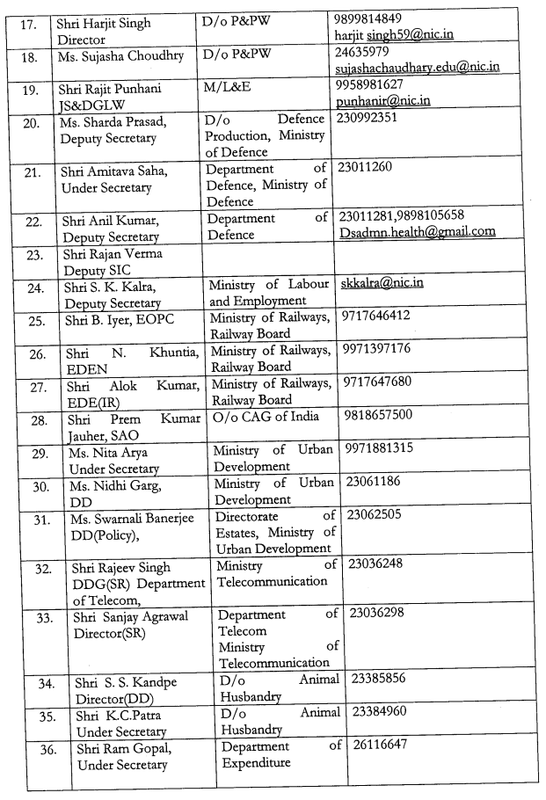 The proposal has been circulated to various Divisions for consideration in MoD and then to refer to DOP&T. DGAQA has conveyed that the comments were called for from various Associations/Unions working in field establishments of DGAQA and most of the Associations/Unions are in agreement with the stand taken by Staff Side on transfer of leave in excess of 120 days to the leave account and not encashing it when a non-industrial employee is transferred to industrial establishment. Air HQ has conveyed that after November, 2006, as per the amended Leave Rules, industrial employees can accumulate and encash Earned Leave up to 300 days. A proposal is also under consideration with MoD to bring the industrial employees under CCS (Leave) Rules, 1972. DRDO has clarified that all the industrial and non-industrial employees of DRDO are allowed to en-cash Earned Leave up to 300 days. JS(E) mentioned that Establishment Division is examining the matter in light of the comments received and will take a decision. Ministry of Health & Family Welfare had vide their O.M. No. B- 12014/01 /2016-JCM dated 05.04.2017 informed that private hospitals empanelled with CGHS had signed Memorandum of Agreement (MoA) with Government to charge at CGHS rates. In case of any excess charging, the same is recovered from the hospital bills by CGHS and paid to the beneficiaries and the hospitals are penalised as per the provisions under the MoA. The representatives requested that specific instances may be brought to their notice so that they can take action. Staff-Side stated that the problem has also been that the rates fixed by CGHS were so low that the hospitals were refusing to admit the CGHS beneficiaries. Another problem is about unpaid bills. They requested that the Ministry of Health & Family Welfare should revise their rates at regular intervals so that the CGHS beneficiaries do not have to suffer more on account of delay. Ministry of Health & Family Welfare hadvide their O.M. No. B-12014 / 01/ 2016-JCM dated 05.04.2017 informed that the requirement of No Objection Certificate had been dispensed with vide O.M. No. S.14025/ 41 / 2015-MS dated 07.12.2016. Department of Expenditure had through their letter dated 10.01.2017 informed that a proposal for revision of income limit to Rs. 9000/- for dependency for the purpose of providing CGHS coverage to family members, received from MoH&FW, had been examined and the comments /approval of that Department was conveyed to the MoH&FW vide D/o Expenditure ID No. 204/EV/ 2016 dated 19.10.2016. With regard to the demand for further review of the limit of Rs. 9000/-, it has been stated that no such proposal has been received in D/o Expenditure from MoH&FW. Ministry of Health & Family Welfare had vide their O.M. No. B-12014 / 01/ 2016-JCM dated 05th April, 2017 informed that the income limit from all sources for dependency for the purpose of availing CGHS had been revised to Rs. 9,000/- plus the Dearness Relief on Pension. It has further added that revision of income limit has been done recently and there is no proposal with reference to review of income limit of Rs. 9,000/-. Staff-Side requested that the revisions have to be in accordance with the “Maintenance and Welfare of Parents and Senior Citizens Act 2007”. It was stated that in one such case the court had directed full reimbursement. They requested that the issue may be re-examined. S. No. 24 – Amendment to the definition of anomaly as notified by Government in the orders of constitution of anomaly committees at various levels JS (Admn and JCA) informed that the definition has been modified and will be further looked into on receipt of the recommendations on allowances. It was decided that the item may be closed. Staff-Side stated that new condition would make it difficult for employees to avail MACP which, as such, is disadvantageous as it is not in the promotional hierarchy. It was stated that the new benchmark was more stringent then the benchmark prescribed for promotion in some cases and the employees will suffer more as they may find it difficult to meet this requirement. The Staff Side further pleaded that the change of benchmark from ‘Good’ to ‘Very Good’ can only have prospective effect and the grant of MACP on the basis of the reports of earlier years when the said stipulation of ‘Very Good’ was not in existence must be calibrated on the basis of the earlier stipulation of the benchmark being `Good’. They stated that DoPT should come out with some guidelines so that the employees could be assessed in an objective manner as many employees may find it impossible to meet the benchmark since the Reporting Officers are themselves not adequately trained in writing APARs. They stated that this provision needs to be reviewed. JS(Admn. and JCA) informed that ever since the introduction of disclosure of APARs, the number of employees getting higher level of gradings may rise. Proposal needed to be evidence based. It was decided that the Ministry of Railways may provide data on the trend of recorded gradings of APARs. (i) The first issue relates to pay fixation on re-employment in Civil Services and Public Sector Banks, etc. D/o Financial Services (DoFS) is stated to have clarified that pay fixation of ex-servicemen would be through protection of pay plus D.A. drawn by them at the time of release from the Armed forces. DoFS orders provide that in addition to the pay fixed on re-employment, pension and other retirement benefits would also be allowed. Establishment Division has clarified to D/o Posts that initial pay on re-employment in case of ex-servicemen who had held posts below Commissioned Officers and civilians, below Group-A, shall be fixed as per the entry pay in the revised pay structure of the re-employed posts applicable in the case of direct recruits appointed on or after 01.01.2006. Staff-Side says there is a contradiction in the two clarifications and, as a result of the ambiguity, one section has benefited (Personnel who are covered under the instructions of DoFS) while others are not (Personnel who are covered under the instructions of DoPT). JS(E) stated that they had received a number of grievances and the Department of Welfare of Ex-Serviceman had also raised this issue. Presently there are two formulations for pay fixation of ex-servicemen — one for Group A posts and another for others — which is not an ideal situation. It was stated that the issue is under active consideration and a decision is likely shortly. Departiiient of Expenditure (DoE) had through their letter dated 09.01.2017 informed that references have been received from various Ministries/ Departments for switching over to revised pay scale after 25.07.2016 and the matter is being examined. Decision in the matter will be communicated in due course. Department of Expenditure had through their letter dated 24.01.2017 informed that it had conveyed its approval for enhancement of calculation ceiling to Rs.7000/- for the purpose of payment of PLB in respect of GDS w.e.f. the accounting year 2014-15 vide ID no. 7/31/12006-E.III(A) dated 27/10/2016. The Staff-Side expressed their satisfaction over the decision. It was decided that the item may be closed. 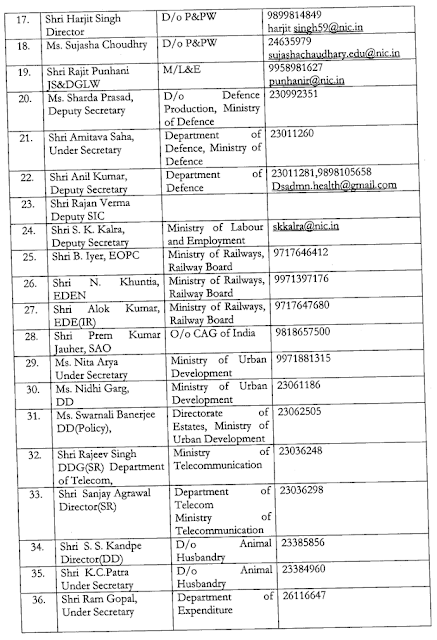 Establishment Division had through their letter dated 10.01.2016 clarified that no such proposal from Ministry of Defence was pending with DoPT and no scheme on the lines of the scheme of 1993 was under consideration. It has been further stated that the judgment of the Constitution Bench in the Uma Devi case bars any regularisation of individuals not selected through a prescribed selection procedure. Therefore, only those casual labours may be regularised who are covered under the 1993 scheme. Staff-Side stated that while the Uma Devi judgment is clear and the instructions have-been-issued by DoPT, there are cases where the casual labourers have not completed 10 years on the date of judgement. The Staff-Side said that the recruitment procedure adopted while engaging the daily rated workers was one and the same for regular employment especially those kept for erstwhile Group-D functions. Therefore, they cannot be said to be backdoor entrants. This apart, they added that such recruitment on purely temporary basis was necessitated and initiated due to the all pervading ban imposed by DoPT in 2001 and continued for almost nine years. Therefore, they said that it is necessary that the DoPT should prepare a scheme by which the quality of employment is maintained as also regularization of persons who have served the government for such long period of time does take place. They also added that these appointments were against regular and permanent vacancies and the Supreme Court judgment in the case of Uma Devi does not debar the government from considering regularization of such cases. As they were working in Government establishments, their condition needs to be appreciated. Establishment Division of DoPT had through their note dated 19.02.2017 informed that vide OM No. 22011/1 /2011/Estt. D dated 27.10.2016 instructions had been issued to Ministries/Departments to ensure strict compliance of guidelines by following model calendar for DPC so as to grant timely promotions. It has been further informed that DoPT (Establishment Division) is in the process of further fine-tuning the model calendar. Staff-Side stated that the situation has arisen because of DoPT OM dated 30.09.2016 following a hearing in the Supreme Court. As such no promotions in any level are taking place and UPSC has also not accepted any DPC proposals for want of further clarification from DoPT. JS(Admn. and JCA) informed that the department is seized of the concerns of the Staff Side and the matter is under active consideration and a decision is awaited. JS(E) stated that this may not be possible without fully understanding the implications in each department. It was stated that it would be appropriate that the posts may be allowed to continue till such time their requirement is felt. Reacting to the comment made by the Official-Side, the Staff-Side pointed out that prima facie, on introduction of computerized functioning in almost all departments, the functions assigned to LDCs have become redundant. What is required is to get the report from each department and take a conscious decision, as LDC is a common category. JS(Admn. and JCA) stated that as the meeting had already gone on for more than three hours, the new agenda items may be taken up for discussion in the next meetings. It was stated that the comments received on the agenda items would be circulated to the Staff Side. Comments on the remaining items which were not included in the agenda would also be called for from the administrative departments and will be circulated to the Staff Side on receipt. The meeting concluded with a vote of thanks to the Chair.